PART of a multi-million pound town centre mixed retail and leisure redevelopment scheme, The Crescent, is to be put on the open market. Hinckley & Bosworth Borough Council have taken the decision to sell their stake of the Hinckley development to help fund new major projects in the borough. Businesses in The Crescent are unaffected by the sale. The borough is celebrating the success of another one of its sporting unsung heroes. 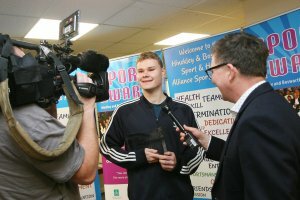 Matthew Chilvers was announced as the East Midlands BBC Sport Unsung Hero on East Midlands Today. He will now go forward to represent the East Midlands at the BBC Sports Personality of the Year awards at the Genting Arena in Birmingham on Sunday, 16 December. A FREE FESTIVE Family Fun run hosted by Hinckley BID and the Borough Council will be held on Sunday 9 December in Hinckley Town Centre. The run, which is just under a mile long, starts at 10.30am from the Market Place in Hinckley with participants invited to dress up as Santa, an elf or reindeer or wear their Christmas jumpers. Borough Council services at the Hinckley Hub will close at 12 noon on Monday 24 December and re-open at 8.30am on Thursday 27 December. Burbage Community Choir Harmonic Voices will be performing an a cappella Christmas Concert at Holy Trinity Church in Hinckley on Saturday 8th December at 7.30pm. Tickets cost £7, including refreshments, and all proceeds will be donated to AMMF, the UK's only charity supporting people with and raising awareness of bile duct cancer. Leicestershire County Council contractors are due to carry out carriageway repair work on Britannia Road on Wednesday 5th December. The road will be closed from the junction of Windsor Street to the junction with Workhouse Lane for one day, with works expected to start at 7.30am. A diversion will take traffic on to the B578 Lutterworth Road and on to Windsor Street. Mayor of Hinckley and Bosworth, Councillor Jan Kirby is urging local residents to join her for a Christmas Litter Pick at Burbage Common on Saturday 8 December from 9.30am to 11.30am. the plans for hospitals and maternity services in Leicester. The event at the Sketchley Lane hotel is part of a series being held across the area. 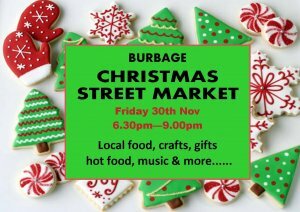 Burbage Parish Council is joining forces with East Midlands Markets and Events to host an evening Christmas Street Market in Windsor Street on November 30. Running from 6.30pm to 9pm, the free event will see the street filled with artisan food, drink and crafts stalls, offering festive fare and gourmet gifts to go.